So I'm still in Cannes visiting John's parents (and enjoying the good weather down here at the same time) which is why my blog posts have been a little sporadic lately, sorry! 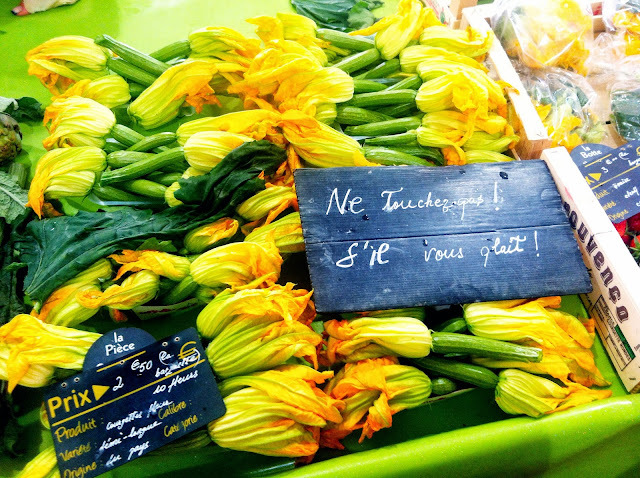 This morning we went to Marché Forville and picked up some beautifully fresh zucchini flowers! I got so excited at their price of 10 for 2.50€ (with the zucchini still attached) and 10 for only 1.50€ (!!!) (without the zucchini attached!). John had to literally tell me to calm down, Nhan calme-toi! because I was trying to tell him too many things at the same time while looking around and running off in different directions in my hyperactive farmers' market state. I always get overstimulated at farmers' markets, especially the ones in Italy and France. I don't know if it's the colours, the smells, the language being spoken or just the general European market atmosphere but I'm like a (hyperactive) kid in a candy store. 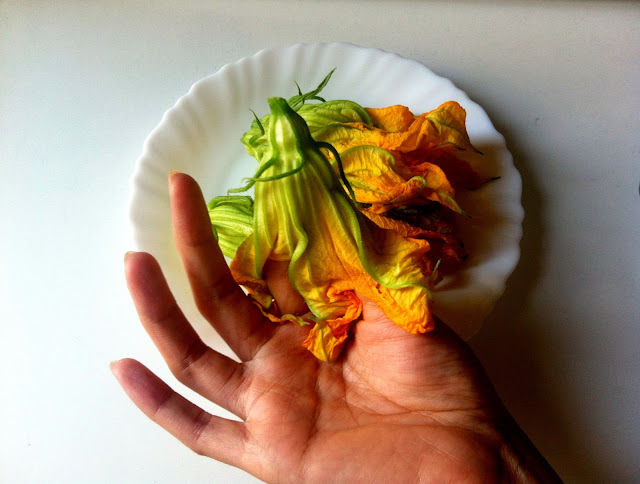 At the zucchini flower stand, I explained to the lady at the stall how much I loved zucchini flowers stuffed with mozzarella and lightly beer battered (how I had eaten them in Italy and Australia and then how I learnt to cook them during my time in Rome in 2013 at Andrea Consoli's Cooking Classes!). The stall lady told me there was a simpler French recipe from Nice that didn't involve any stuffing. Just your normal French crêpe batter but with beer/sparkling water and some chopped garlic and parsley. 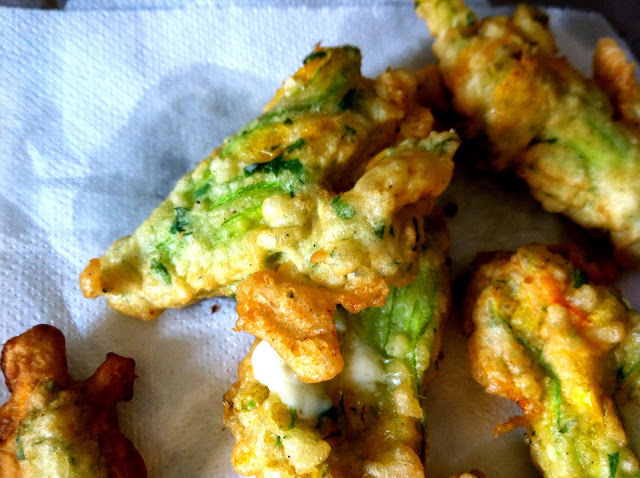 My mouth was watering as we discussed how to best cook the zucchini flowers. Imagine adding garlic in the batter and how it would just take things to another level.. Anyway, so on the walk back to John's parents' place from the market I decided to fuse the Italian recipe I had learnt from my cooking class in Rome and French recipe of the market lady together. 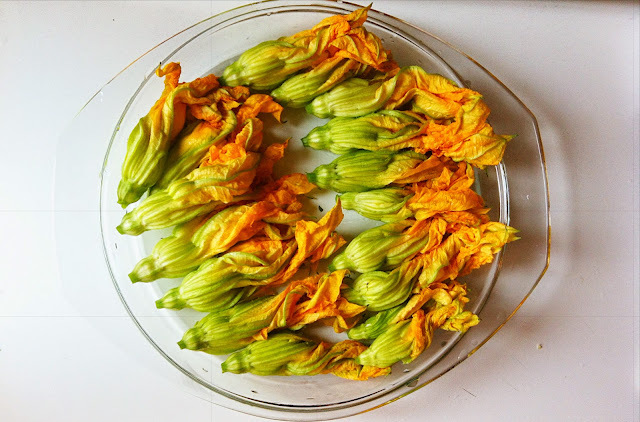 When I "lived" in Rome for 6 weeks in 2013, I attended this fantastic cooking class and the entrée I requested to be in the course were these stuffed zucchini flowers so I knew that this recipe would work again. Now my idea would be just to add the Niçoise touch to the plain batter. 1. 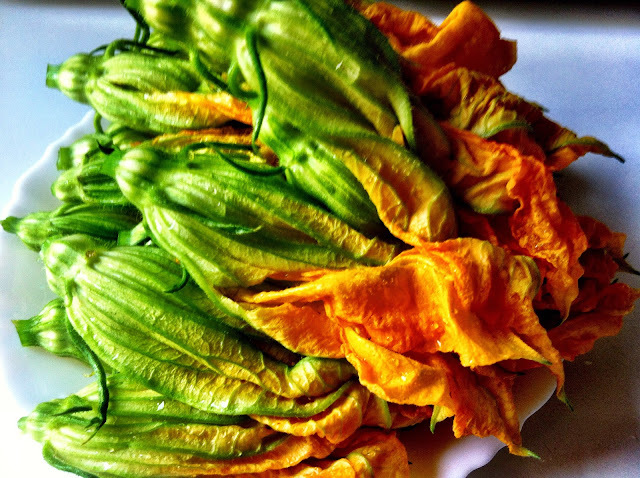 Prepare your zucchini flowers by removing those spiky, prickly dark green pokey out bits and trimming the stalk. 2. This is probably the hardest step. 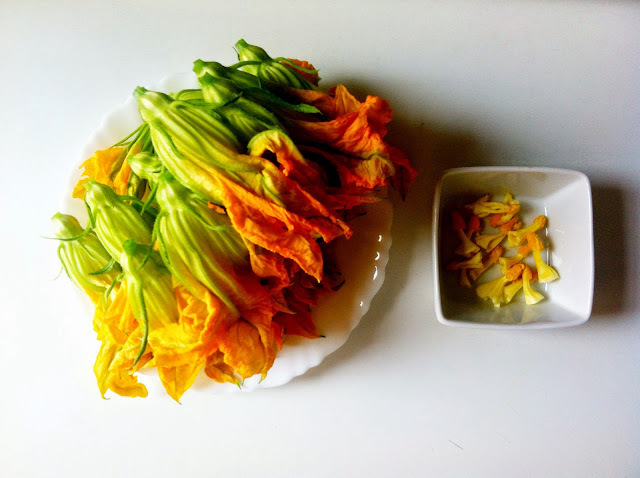 You need to gently remove the pistil of the flower without tearing its petals. You'll need to get your thumb and index finger right in then gently but swiftly snip off the pistil with your nail against the other finger. 3. It should look like this below when all removed. b) melt in the hot oil! 5. Stuff your zucchini flowers with the wedges of mozzarella. 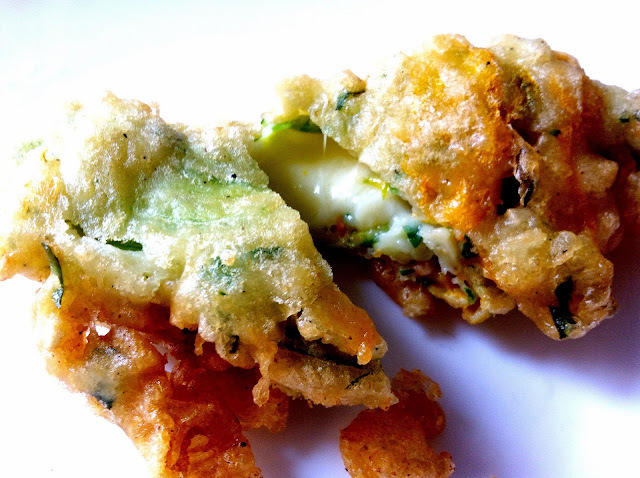 Don't add too much because you want the petal to cover the mozzarella so that the batter will hold the petal. 6. Prepare the batter by adding the cold beer to the 200g of flour until it forms an elastic and smooth thick batter. Add the glass of cold sparkling water, 1 teaspoon of salt and 1 teaspoon of olive oil. Chef Andrea Consoli even recommends adding a few ice cubes if your beer and sparkling water aren't cold enough in order to make the batter even crunchier. 7. 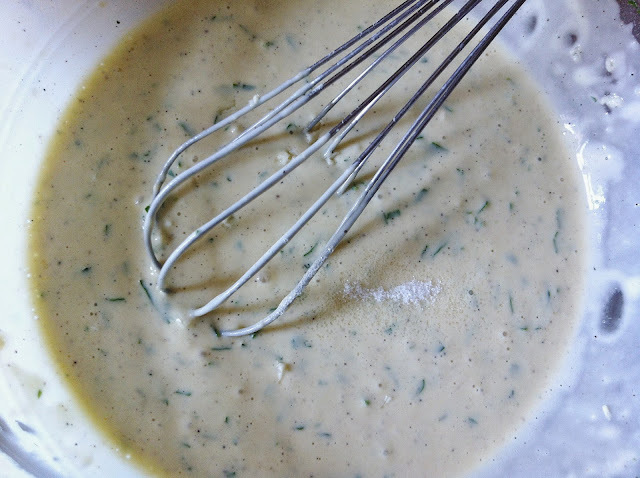 Now for the French twist, add the chopped garlic and parsley to the batter mixture! 8. Ok now this is the dangerous part. 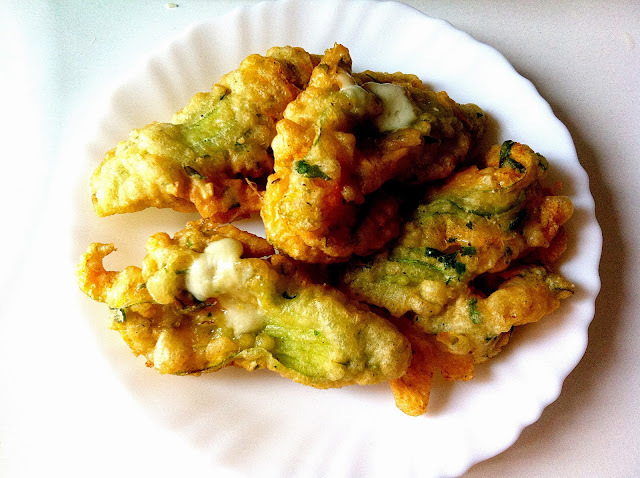 Dip the stuffed zucchini flower into the batter mixture completely covering it. Gently slide it into the hot oil from the side of the pot (step away in case the hot oil splashes from the water of the mozzarella). Fry them on both sides and take them out as soon as they are golden (it should take a couple of minutes max). You want them to stay crispy on the outside but melty and gooey on the inside. Yummmm. 9. 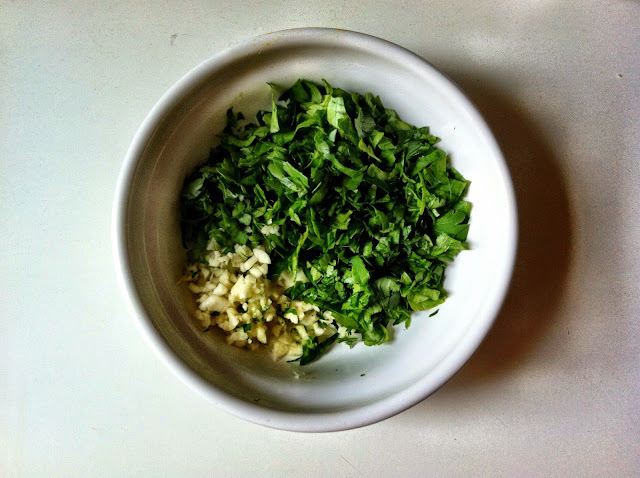 Serve with a few fresh parsley sprigs and some salt and pepper on the top! 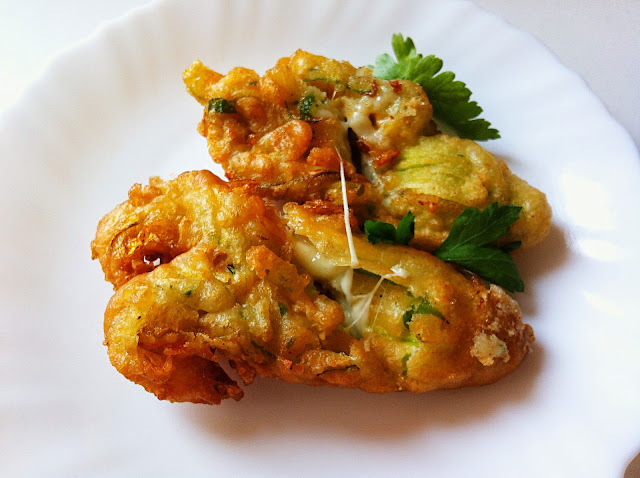 There you have it, lightly battered mozzarella stuffed zucchini flowers with a French twist.